Be the proud owner of a beautiful alpaca fur rug, your bare feet treated to the touch of luxury each morning. Our Alpaca skins are tanned, softened and handcrafted to the highest standards by skilled artisans in Peru. The alpacas have not been killed for their fur. Our skins are ethically sourced from Suri alpacas which have died of natural causes. Each throw is made from lots of small pieces, carefully matched for colour, texture and shape and therefore no two throws are alike. An over-dye is commonly applied to the skin to achieve a more even consistency of colour. The standard backing is a practical wipe-clean microfibre suede. Our throws are suitable as floor rugs, particularly as bedside rugs, as they are very hard wearing. We recommend underlay and non-slip grips, but suggest that it is best not to put them in main hallways and corridors. 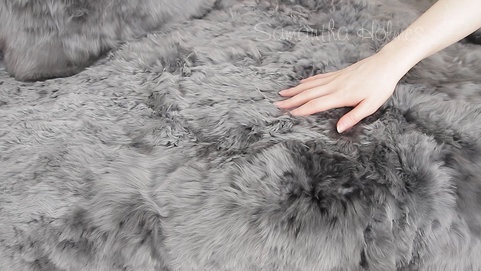 View a video of our Fur throws here. Alpaca is one of the softest, most durable and insulating natural fibres in the world. It is also hypoallergenic, unlike sheepskin, as it contains no lanolin, which is a known irritant to sensitive skins. Our skins are ethically sourced from Suri and Huacaya alpacas which have died of natural causes, mainly from the weaker animals and baby alpacas – or ‘cria’, as they are known. Alpacas roam freely in their natural terrain on the Altiplano of the Andes where Winter temperatures can plummet below 15 degrees Celsius. It is not financially viable for farmers to kill their baby alpacas for their skins. The skins are tiny and worth little compared with fleeces which can be shorn during a whole lifetime. Alpacas can live for 20 years promising shearing potential of far greater value than a single pelt. We also offer a bespoke service where we can produce to a variety of colours, and to any size or format. Please note a 50% deposit is required on order confirmation for all bespoke orders. Colour swatch samples available on request. To place a bespoke order, please contact us by email or at the number above. We have a limited supply of throws available immediately. If the one you desire is not in stock it will be made to order and the leadtime can vary between 1 and 3 months, depending on the size and time of year you are buying. I ordered a custom size fur throw, the order worked just by sending an email request. The wait for the throw was a bit long. But when I got the product, the wait was totally worth it. Gorgeous throw, just as I imagined it, care instructions, and the team who took time to update me on the timing and the wait. Thanks! I just wanted to say a big thank you for your help in ensuring I received my Alpaca throw so quickly.